New York Yankees first baseman Andy Phillips will miss the rest of the season and will need surgery to repair a fractured wrist after being hit on the right hand Sunday. Phillips was hit on his right hand by Devil Ray’s starting pitcher Jason Hammel in the fifth inning. He stayed in the game and scored on a double by Melky Cabrera only to be replaced by Wilson Betemit at first to start the sixth. After the game he was taken to the hospital to have an MRI and X-Rays taken on his hand only to reveal a broken pisiform bone in his wrist. He will have surgery on the hand today and will need at least 4 weeks to recover according to the NY Post. "It's disappointing, the time of it more than anything," said Phillips to the Post about possibly missing the playoffs. Andy has been having a strong season this year batting .292 in 61 games. This came after he missed most of spring training then lost his spot on the roster to Josh Phelps who had been a non-roster invitee. Although after Phelps’ play was less than stellar and Doug Mientkiewicz sustained a pair of injuries Phillips was called up as a stopgap and wound up being the permanent replacement because of his strong play offensively and defensively. 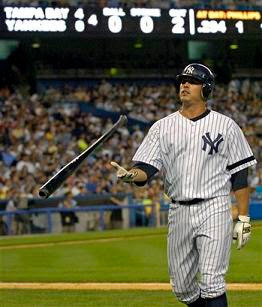 Now that he is faced with the possibility of missing the remainder of the season the Yankees will turn to Jason Giambi who lately has been all leather. "Jason will be the No. 1 priority," Torre said in the Post. "We are not going to push the envelope. We will still DH if Johnny [Damon] needs a day off." When the Giambino does sit or DH the team will continue to turn to Wilson Betemit at first and even go back to Mientkiewicz. Doug Alphabet, who has finally recovered from a broken wrist and concussion he sustained after running into Red Sox Mike Lowell at first base on June 2nd, was recalled September 1st when the rosters were expanded to 40 players. For more NY Sports turn to Hot Stove New York.com.